Kick off your visit on the 23rd (Sat): take in the spiritual surroundings of Temple Square. To see traveler tips, where to stay, photos, and tourist information, refer to the Salt Lake City road trip tool . Kalispell to Salt Lake City is an approximately 4.5-hour flight. You can also drive. In March, Salt Lake City is a bit warmer than Kalispell - with highs of 58°F and lows of 38°F. On the 24th (Sun), you'll have the morning to explore before heading off to Flagstaff. To find ratings, photos, other places to visit, and tourist information, go to the Flagstaff trip planner. Fly from Salt Lake City to Flagstaff in 7 hours. Alternatively, you can do a combination of flight and shuttle; or drive. Traveling from Salt Lake City in March, Flagstaff is a bit cooler at night with lows of 25°F. You will leave for Grand Canyon National Park on the 25th (Mon). Kick off your visit on the 25th (Mon): explore the stunning scenery at Yavapai Point, get great views at Yaki Point, then trek along South Kaibab Trail, and finally take in breathtaking views at Grand Canyon South Rim. To see more things to do, ratings, where to stay, and other tourist information, read our Grand Canyon National Park trip planner . Drive from Flagstaff to Grand Canyon National Park in 1.5 hours. March in Grand Canyon National Park sees daily highs of 57°F and lows of 23°F at night. Wrap up your sightseeing on the 25th (Mon) early enough to drive to Flagstaff. For photos, other places to visit, maps, and tourist information, you can read our Flagstaff trip planning app . Traveling by car from Grand Canyon National Park to Flagstaff takes 1.5 hours. On the 26th (Tue), you're off toSedona. On the 26th (Tue), hike along Doe Mountain Trail, take in the spiritual surroundings of Amitabha Stupa & Peace Park, and then contemplate in the serene atmosphere at Chapel of the Holy Cross. For where to stay, photos, and tourist information, go to the Sedona trip planner . Getting from Flagstaff to Sedona by bus takes about an hour. Other options: drive. Expect a bit warmer temperatures when traveling from Flagstaff in March; daily highs in Sedona reach 67°F and lows reach 45°F. Wrap up your sightseeing on the 26th (Tue) early enough to drive to Phoenix. Phoenix is the capital and most populous city of the U.S. Start off your visit on the 27th (Wed): examine the collection at Musical Instrument Museum, admire the natural beauty at Desert Botanical Garden, and then take in nature's colorful creations at Japanese Friendship Garden. To find more things to do, reviews, traveler tips, and tourist information, you can read our Phoenix trip planner . Drive from Sedona to Phoenix in 2.5 hours. Alternatively, you can do a combination of taxi and flight; or take a shuttle. 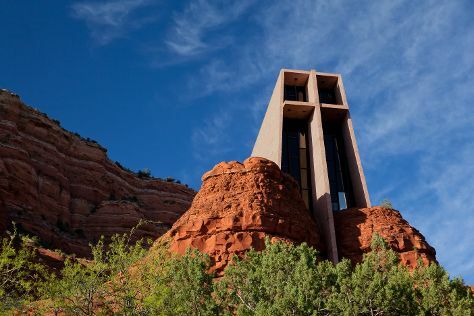 Prepare for somewhat warmer weather when traveling from Sedona in March: high temperatures in Phoenix hover around 82°F and lows are around 57°F. You will have some time to spend on the 28th (Thu) before leaving for Salt Lake City. For ratings, traveler tips, maps, and more tourist information, read Salt Lake City attractions planning website . You can fly from Phoenix to Salt Lake City in 4 hours. Other options are to drive; or take a bus. While traveling from Phoenix, expect colder days and little chillier nights in Salt Lake City, ranging from highs of 58°F to lows of 38°F. You'll have a few hours on the 29th (Fri) to wrap things up before traveling home.